These quotes were written in 1996. As I reread them a couple weeks ago, I realized how relevant they were for 2010. In the age of stylists as celebrities, famous bloggers, and designer reality shows. I hope you agree. 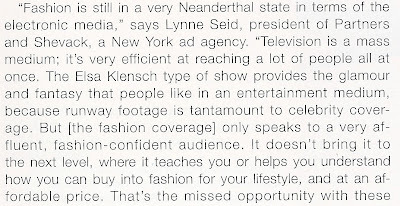 Article: Why Doesn't Fashion Work on TV? 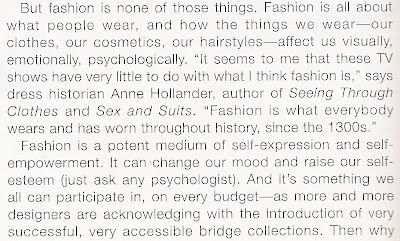 Yes, but I still want to connect with fashion beyond the pages of magazines and retail stores. 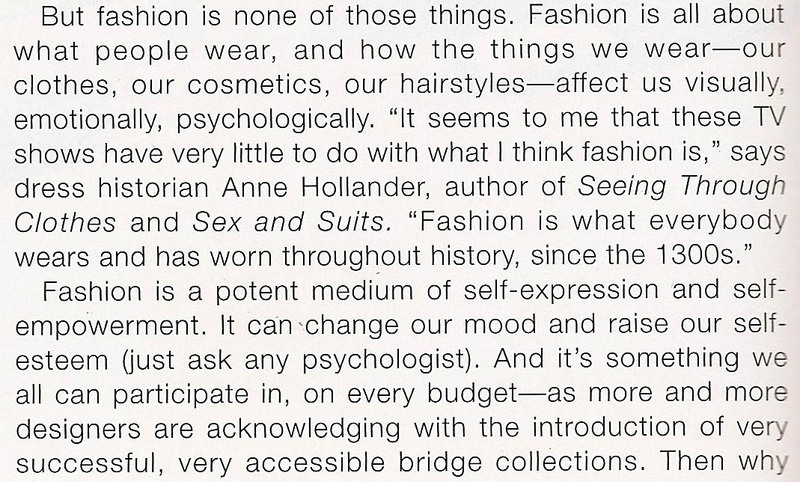 But no one around me is talking about fashion the same way I feel about fashion. I need to find these people who know who I am speaking of when I mention Melanie Ward. The Internet and social media is free! And we love the outrageous. It all makes sense. 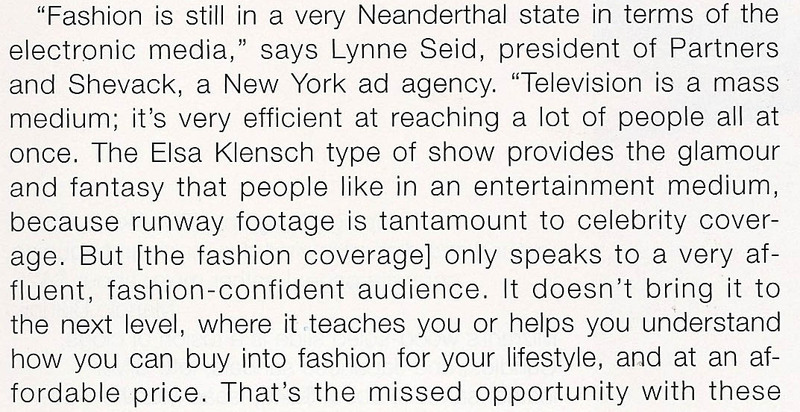 The Internet, blogs, Facebook, Twitter are all a part of the evolution of fashion media. Print is not dead, and it can not die. We need it as much as it needs us. We are here to celebrate it. And if you miss Elsa Klensch as much as I do, please watch the following YouTube videos. Every Saturday morning at 9:30 am, Elsa justified my love of fashion when I was younger. Look, Mom and Dad, runway shows are on CNN! Fashion is important! is there any way you can scan the whole thing? of course! i just emailed you a copy. if anyone else would like a full scan, contact me and i'll email you the article. YES to the 10th power! thank you so much for this blog that article is so relevant and elsa klensh is a classic!...she made my saturday mornings, as well. 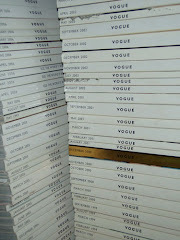 along with tim blanks, jeanne beker and cindy crawford (House of Style)....those were the days!